This catalogue is part of the ‘Nordic Sustainable Cities’ project, one of the flagship projects within “Nordic Solutions to Global Challenges”, an initiative launched by the Nordic Prime Ministers. The cases presented here were selected through an open call inviting stakeholders like municipalities, NGOs and local associations as well as companies to submit entries. The open call was supplemented with desktop research and interviews with experts to get as broad a range of cases as possible. All pre-selected cases were evaluated by a jury consisting of government representatives from the Nordic countries, who selected 54 cases that exemplify the ideas outlined in the ‘White Paper on Nordic Sustainable Cities’. 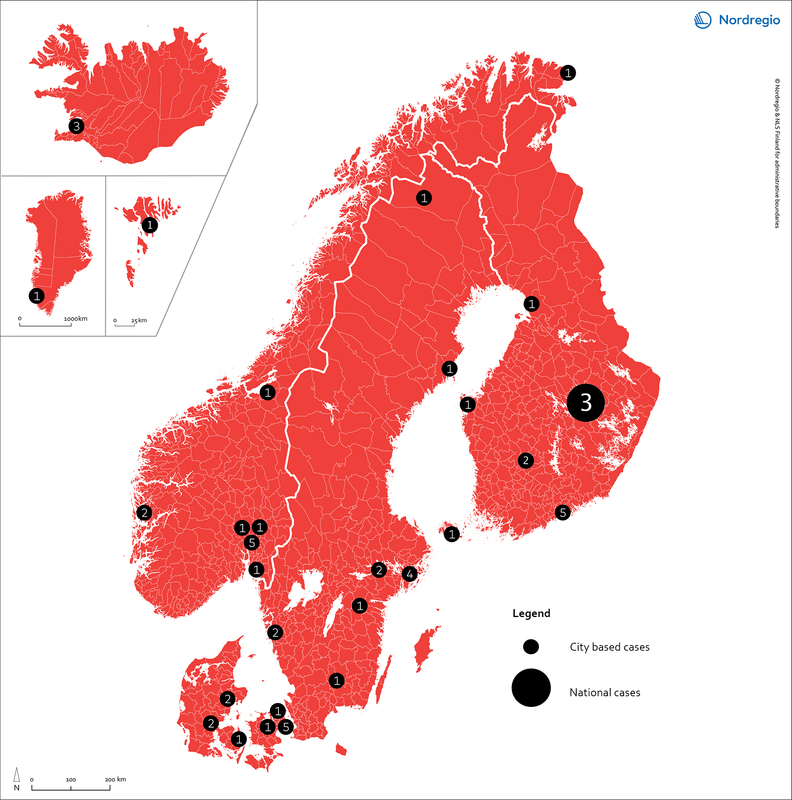 The map below shows the number of cases and their respective location in the Nordic Region. The catalogue was developed by Nordregio on behalf of Nordic Innovation, the project manager of ‘Nordic Sustainable Cities’ based on the criteria outlined in the ‘White Paper on Nordic Sustainable Cities’ produced by Nordregio. Cases descriptions: Luciane Aguiar Borges, Linda Randall, Arne Kempers, Mari Wøien, Laura Fagerlund with the collaboration of stakeholders responsible for the cases. Located in the heart of Helsinki beside the famous market square, Allas Sea Pool combines traditional Finnish spa culture with modern urban life. An old railroad (Baana) trench has been re-imagined to provide a fast, safe connection between the harbour and the city centre for cyclists and pedestrians. Managing the increasing amount of waste generated in urban spaces is a common challenge to cities worldwide. Since March 2017, Stockholm has been working to address this problem by opening the first large scale biochar plant. Bybanen light rail system responds to the need for an efficient, environmentally friendly transportation system able to cope with the limited space in the central streets of the City of Bergen. Carbon Track & Trace provides cities with the means to accurately measure their carbon emissions and monitor their progress towards international climate targets. CityPlanner supports large scale visualisation, allowing anyone to create scenes in a virtual 3D model of a district, city or even a whole nation. The tool can be used to develop life-like plans and scenarios, and test out ideas. Located just 200 meters from Copenhagen City Hall, this former industrial harbour has been transformed from a polluted area to a clean, healthy environment for swimming, fishing and leisure activities. The ElectriCity partnership began in 2013 with the aim of creating sustainable attractive public transport.